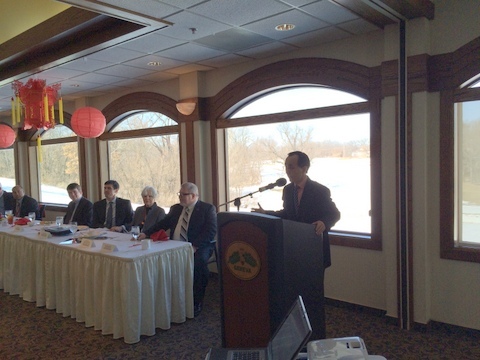 The conference was hosted by the City of Muscatine to raise awareness of the local community about the work of the Mayor's Muscatine-China Initiative Committee (MMCIC), which was established in 2012 to deepen friendship and promote education, trade and investment cooperation with China. Mayor of Muscatine DeWayne Hopkins, the MMCIC President Tony Joseph and other officials briefed the 100-strong audience on the accomplishments and future plans of the Committee. Liu spoke highly of the important role of the City of Muscatine and the MMCIC in enhancing people's friendship and pragmatic cooperation between China and the city. He said that the Chinese Consulate General in Chicago will continue to provide its support and assistance to the committee. 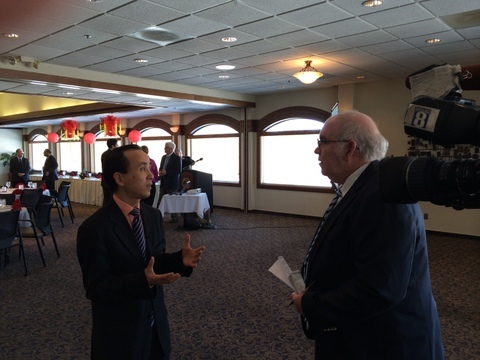 Before the conference, Liu was interviewed by WQAD8 TV channel and Muscatine Journal.